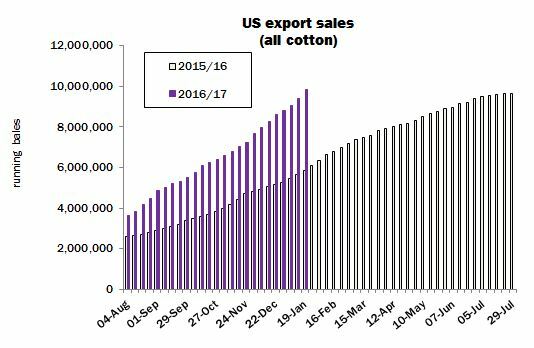 International cotton prices broke out of their previous trading range during January, to end the period some five US cents higher. The Cotlook A Index started the period at its low point of 79.65 cents per lb, before rising sharply after the turn of the year, and remaining several cents above that level for the duration of the month. 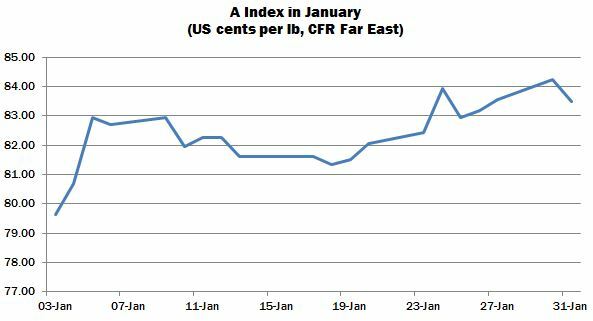 January ended close to the Index’s high point, of 84.25 cents per lb. The rise in upland prices was led by New York futures, which in turn were influenced by mill fixations against ‘on-call’ contracts, as well as fund buying, rather than physical market fundamentals. Speculators’ long positions remained substantial and high open interest continued to imply an increased propensity for price volatility. Though the need for many mills to ‘fix’ remained a short-term supportive factor, traders were increasingly conscious of July’s widening premium over ICE December, which by January 31 had widened to over 400 cent points per lb. Mill demand for many origins was relatively limited, at the higher prices, and the perception was that many spinners had secured their most pressing requirements ahead of New York’s rally. Demand was primarily of a gap-filling nature, with the usual consuming markets placing modest orders for a range of growths. 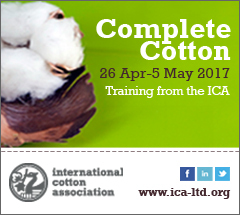 Indian cotton attracted less demand than would be expected at this point in the season, on price considerations. The above-mentioned strength of export offering rates from India stemmed from uncommonly high prices on the domestic market. The fallout from the government’s ‘demonetisation’ policy, introduced in November, continued to be felt and supply side issues were so supportive to prices that sporadic import demand was in evidence during the month, at a much earlier point in the season than may usually be envisaged. Cumulative seed cotton arrivals remained behind the volume witnessed at the same point in 2016. Given the protracted disruption to supply, marketing of the Indian crop was delayed and the potential therefore exists for a larger tranche of Indian cotton than usual to be available for export as the season progresses. The African Franc Zone crop continued to benefit from the lack of Indian competition, with the result that the crops are now very well sold from first hands, the nearby availability from merchants’ holdings is limited, and (as was the case last season) those trade positions are likely to be depleted well before the end of the season. The pace of US export sales remained robust and was maintained by dint of price discounts relative to New York. The perception that the bumper Australian crop may present strong competition later in the season no doubt influenced US merchants’ aggressive marketing strategy. Cumulative sales by the week ended January 19 had already surpassed 80 percent of USDA’s current projection of exports during the season and stood some four million running bales ahead of the same point in 2016, prompting the consensus among observers that a further upward adjustment to Washington’s forecast appears increasingly likely. USDA’s January supply and demand estimates increased projected exports by 300,000 bales, to 12.5 million, but that increase was more than offset by an increase in the domestic production forecast, to nearly 17 million. As a result, projected ending stocks were raised by 200,000 bales, to five million, implying a rise of 1.2 million during the course of the 2016/17 season. Following a spate of import buying from China, as mills received allocations of 2017 import quota, demand slowed somewhat in the approach to the Lunar New Year holidays, though the destination continued to feature in US export reports. Markets will reopen in early February, with the state reserve auction series scheduled to begin just four weeks later, around two months earlier than the series began last year, and it was suggested that most Chinese spinners are now in possession of sufficient inventory to tide them over until the commencement of auction sales. Cotlook’s assessment of Chinese production was raised in January by 250,000 tonnes, to 4.75 million, primarily to reflect classing data from Xinjiang. Internal stock levels are therefore expected to decline this season by a narrower margin than put forward in our last report, despite a considerable increase to the figure for consumption, which was prompted by strong growth in spinning capacity in Xinjiang. Import restrictions and stock reduction via the domestic reserve auctions are likely to shape China’s cotton policy for some time to come, but the country’s eventual return as the world’s largest importer, at some point over the next few seasons, remains a feature of the medium to longer term market outlook. Other changes to Cotlook’s estimates of supply and demand included a decrease to Indian output, prompted by the reported sluggish pace of seed cotton arrivals, and a reduction for Pakistan, which was informed by the sharp slowdown of late-season seed cotton arrivals. Our production figure for US was raised, to match Washington’s January assessment of almost 17 million bales, some one million bales (480 lb) higher than the assessment put forth in August (which represented the first of the season to be based on objective field surveys). The expectation for Australia was also increased, to one million tonnes, over 400,000 tonnes more than in the previous season. Consumption underwent an overall reduction. Mill use in India was impacted by the above mentioned issues in the local market, and was reduced to 5.1 million tonnes, lower than last year’s figure. Modest downturns were also in evidence for Pakistan and various other markets, with inter-fibre competition remaining a persistent threat to cotton’s market share. 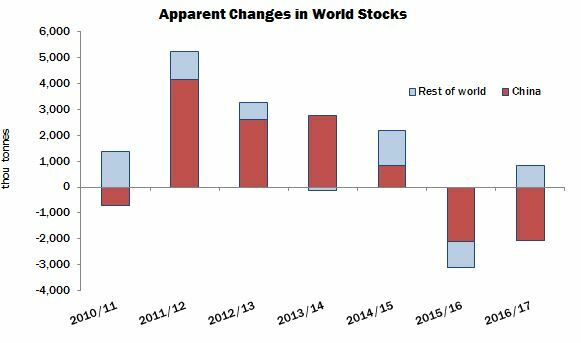 While the world stock balance therefore displays a reduction at the end of 2016/17 of 1.24 million tonnes, the weak pattern of global consumption and increased expectation of output resulted in Cotton Outlook’s estimate that world stocks outside China will witness an addition of over 800,000 tonnes by the end of this season. Our initial forecasts of world production and consumption in the 2017/18 season will be published in late February.